The team over at Outsmarting Technologies have created a new rugged compact multitool which has been aptly named the GRIPsher. Which as you can see from the image above contains a wealth of different tools in a compact form factor. Check out the promotional video below to learn more about his design and wealth of features which have been combined into a rugged design that has been created to offer unparalleled functionality as well as a program to provide military members with a multitool for free. Meet GRIPsher. 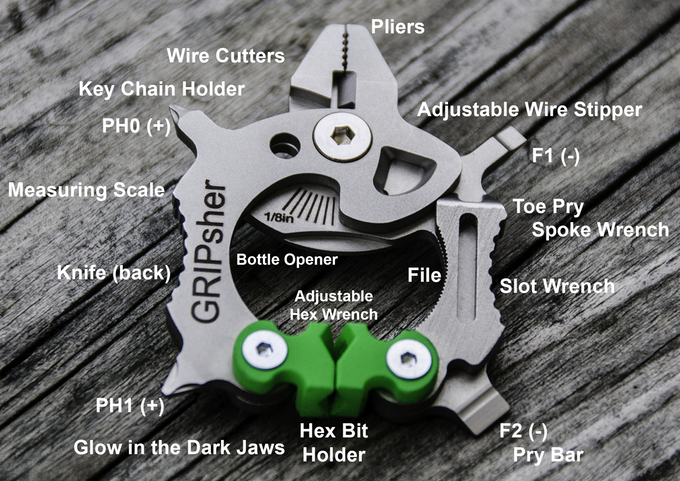 GRIPsher is a compact style multitool that packs functionality into a small, light, and robust size. It was dreamt up by an Army Veteran, refined by an MIT engineer, and brought to life with common sense. GRIPsher is not like the other compact multitools you own. While many other tools claim useless functions, stretch the imagination of possibilites, or simply have tools that do not work well, GRIPsher means business. It is over engineered to provide unparalleled functionality and utilization. GRIPsher is a natural extension of your hand. It is designed to replace all the times you use your finger tips to pinch a hex bolt, your finger nail to screw in a flat head, or pinch a wire to strip it. GRIPsher is packed with real and true functionality. Features and tools included were carefully thought out and refined based on actual user feedback. We wasted no time trying to stick in another ‘nail scraper’ or a ‘can opener.’ Instead, we observed which functions on a multi tool users actually use and optimized these tools to be readily accessible and functional using a single hand. This is no ordinary addition to your Everyday Carry (EDC). For more information on the new GRIPsher Compact Rugged Multi-Tool jump over to the Kickstarter website for details by following the link below.